First, I’ll need an existing SQS standard queue or I’ll need to create one. I’ll go over to the AWS Management Console and open up SQS to create a new queue. Let’s give it a fun name. At the moment the Lambda triggers only work with standard queues and not FIFO queues. 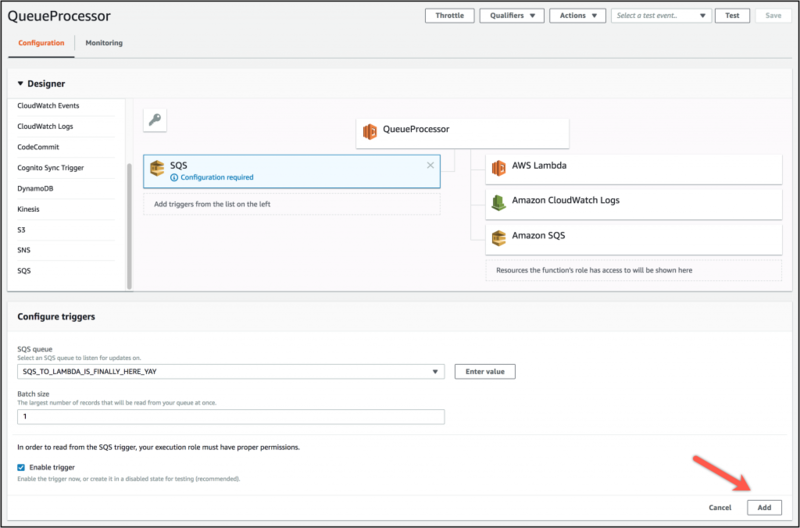 Next I need to add the trigger to the Lambda function, but before I can do that I need to make sure my AWS Identity and Access Management (IAM) execution role for the function has the correct permissons to talk to SQS. The details of creating that role can be found in our documentation. With the correct permissions in place I can add the SQS trigger by selecting SQS in the triggers section on the left side of the console. I can select which queue I want to use to invoke the Lambda and the maximum number of records a single Lambda will process (up to 10, based on the SQS ReceiveMessage API). Lambda will automatically scale out horizontally consume the messages in my queue. Lambda will try to consume the queue as quickly and effeciently as possible by maximizing concurrency within the bounds of each service. As the queue traffic fluctuates the Lambda service will scale the polling operations up and down based on the number of inflight messages. I’ve covered this behavior in more detail in the additional info section at the bottom of this post. In order to control the concurrency on the Lambda service side I can increase or decrease the concurrent execution limit for my function. For each batch of messages processed if the function returns successfully then those messages will be removed from the queue. If the function errors out or times out then the messages will return to the queue after the visibility timeout set on the queue. Just as a quick note here, our Lambda function timeout has to be lower than the queue’s visibility timeout in order to create the event mapping from SQS to Lambda. After adding the trigger, I can make any other changes I want to the function and save it. If we hop back over to the SQS console we can see the trigger is registered. I can create, configure, and edit the trigger from the SQS console as well. aws sqs send-message --queue-url https://sqs.us-east-2.amazonaws.com/123456789/SQS_TO_LAMBDA_IS_FINALLY_HERE_YAY --message-body "hello, world"
My Lambda receives the message and executes the code printing the message payload into my Amazon CloudWatch logs. Of course all of this works with AWS SAM out of the box. So, a quick deep dive on concurrency and automatic scaling here – just keep in mind that this behavior could change. The automatic scaling behavior of Lambda is designed to keep polling costs low when a queue is empty while simultaneously letting us scale up to high throughput when the queue is being used heavily. When an SQS event source mapping is initially created and enabled, or when messages first appear after a period with no traffic, then the Lambda service will begin polling the SQS queue using five parallel long-polling connections. The Lambda service monitors the number of inflight messages, and when it detects that this number is trending up, it will increase the polling frequency by 20 ReceiveMessage requests per minute and the function concurrency by 60 calls per minute. As long as the queue remains busy it will continue to scale until it hits the function concurrency limits. As the number of inflight messages trends down Lambda will reduce the polling frequency by 10 ReceiveMessage requests per minute and decrease the concurrency used to invoke our function by 30 calls per-minute. The documentation is up to date with more info than what’s contained in this post. You can find an example SQS event payload there as well. You can find more details from the SQS side in their documentation. This feature is immediately available in all regions where Lambda is available. As always, we’re excited to hear feedback about this feature either on Twitter or in the comments below. Finally, I just want to give a quick shout out to the Lambda team members who put a lot of thought into the integration of these two services.